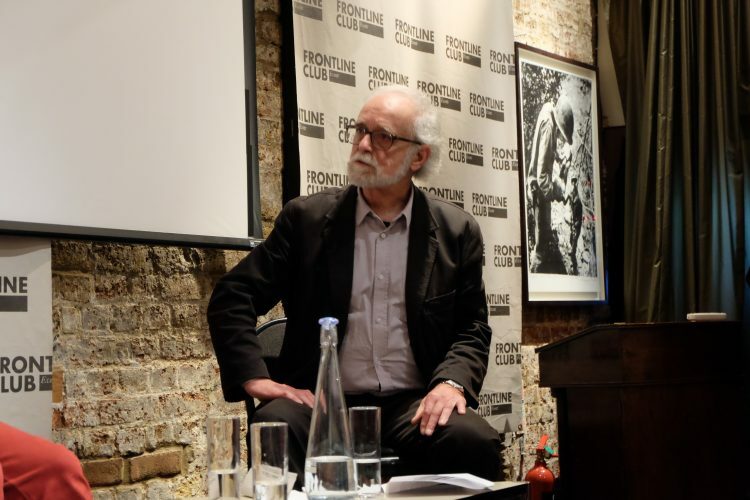 “The fact that we can even make these films is representative of the change in this country,” said Lamin Oo, speaking to a full Frontline Club from Burma. 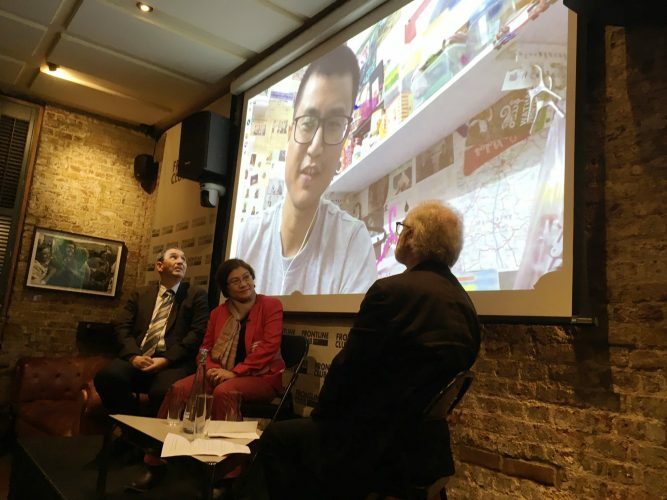 Oo is one of his nation’s predominant emerging filmmakers and of the many talents being showcased at the Frontline Club’s ‘A Country in Motion: Films From Burma’ event. Organised by the Czech Centre, the films highlight the recent political, cultural and social transitions in Burma. Four films were exhibited. The Little Finger, A Peaceful Land, I Wanna Go To School and A Buffalo Boy. Focusing on a range of issues including development, human rights, democracy, education and exploitation, the films provided an illuminating insight into life in modern day Myanmar. Chaired by the former Czech ambassador to the UK, Pavel Seifter, the event drew on the remarkable work being produced by a selection of Burma’s emerging filmmakers. 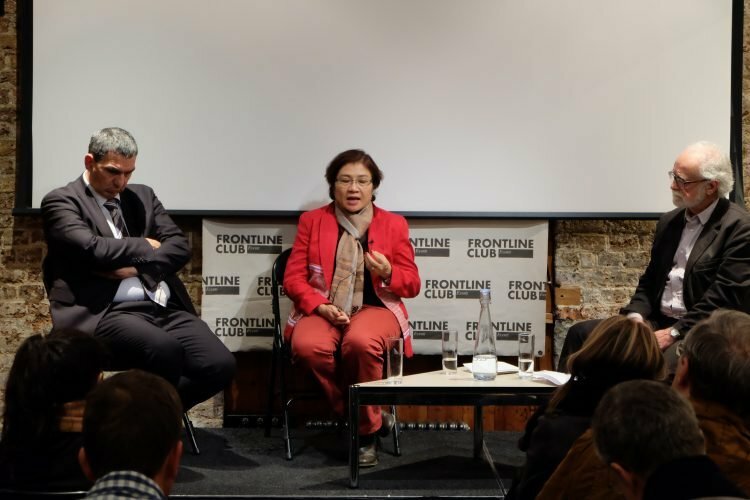 During the open discussion after the films’ airing, Seifter was joined on stage by Burmese MP Susanna Hla Hla Soe (National League for Democracy Party) and the internationally renowned human rights campaigner Igor Blaževič. Oo joined on Skype. Addressing the crowd from his native Burma, Oo is broadly positive about the course of progress in his country. He cautions however that further change is needed and highlights aspects of Burmese life that remain problematic. Oo spoke of the need to tell stories that had not been possible to tell in the past, rationalising that as a result, many of the documentaries emerging out of Burma are testimonial in nature. “First is the military… the military protects the constitution and the constitution protects the military. The second problem is ongoing civil war… there is profound disagreement between the ethnic minorities and those in power. The third problem is ethnic nationalism… and the fourth problem is that the country is economically captured by the oligarchy groups created under the military”. Oo concurred that the Army represents a major obstacle to further progress in Myanmar: “Now there is a new distinction between the Army and the Government. They used to be the same thing. It is fine to criticise the Government but the Army remain hard to touch”. He explained that filmmakers still have to submit material to a censorship board which decides upon what may or may not be shown to the wider public. This process prevented a number of films containing material critical of the Army from being shown at the Human Rights Human Dignity International Film Festival in June this year. MP Susanna Hla Hla Soe concluded: “The first challenge is the expectation of the people… They would like to see the new Myanamar happen, but change is slow”. The Little Finger portrays the tale of the Burmese democracy in its infancy, covering the 2015 election from the perspective of two women leading notably different lives. One of the women filmed was Susanna Hla Hla (a guest at the Frontline Club for the evening), a parliamentary candidate for the National League for Democracy party, headed by Aung San Suu Kyi. The other is a grass grower living and working in rural Burma. The film exposes the flowering yet fragile state of Burmese democracy. The shots of voting day queues, an old man sitting patiently waiting to cast his vote, a young man taking a ‘selfie’ in the queue, contrast with the concerns expressed by NLD activists regarding election tampering and voter documentation malpractice. The Little Finger reveals the intertwined excitement and nervousness of democracy in action. It is hopeful yet truthful, it doesn’t fail to expose the disappointment felt by those left out of the democratic process. “They never failed to collect our taxes but now they are saying we can’t vote,” says one man upon finding out he can’t be registered to vote due to residential status issues. A warts and all look at the democratic process in action — The Little Finger records the joy of those who have waited so long for the vote exercising their democratic right, and the pain felt by those who’s wait goes on. The early shots of toy soldiers in the sand beautifully set the scene for the story that unfolds throughout A Peaceful Land. This is the tale of land taken, of an entire way of life disrupted. Drawing on a range of interviews with those impacted, the film documents the 2005 government initiated nation-wide campaign to plant Physic Nut – a bush-like tree, used for biodiesel production. Following Government orders, the Army set about confiscating acres of farmland as part of the programme, forcing farmers to plant the trees and work the land appropriated. Faced with hardship and injustice, four courageous farmers from Nat Mauk (Magway Division) stood up against the authorities and fought for their rights and land. Following prolonged harassment and even in some cases imprisonment, the afflicted were offered miserly compensation from the Government in return for seized acreage. Many felt forced to accept the terms and as such lost their deep connection to their farmland. Despite intense pressure from the authorities, one female farmer explains why she refused to give up her plot: “The money will run out in the end, but the farmland will never run out”. The documentary is beautifully shot and tenderly portrays the widespread pain felt by Burmese farmers at their loss of land and community. The documentary closes with frames depicting earth eroding into a river beside rural fields, symbolising the farmers plight. A powerful, short animation about a Burmese brother and sister who dream of going to school together. The story demonstrates effectively the obstacles to education faced by children in Burma. It highlights the prevalence and impact of gender inequality, poverty, child labour and abuse. With one in five Burmese children not in education and one in three Burmese children working, the story told is sadly an everyday reality for many young boys and girls in Myanmar. A fiction film detailing the life of a small boy in a rural village in the Burmese countryside. The boy is caught in the midst of warring parents, with his father a destructive opium addict and his mother struggling to provide for the family. The boy longs for an education and to join the other children from his village at school but is instead forced to work for the family, performing tasks such as gathering water and organising the family home. The film provides a potent insight into the life of this one young boy, carefully detailing the everyday defeats inflicted upon him which curtail his happiness and development. After an argument between his parents, his mother is arrested whilst trying to buy opium for his father. The boy is left alone with his dad and is soon after sold off to a stranger to finance his father’s habit. Hard hitting, raw and skilfully weaved together, this is the story of the innocence of youth lost.